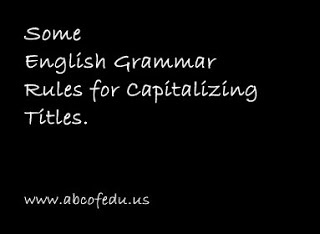 Some English Grammar Rules for Capitalizing Titles. It is really important for you that your work usually adheres to the correct procedures for the capitalization of the names of books, movies, songs, poems, plays, events etc. It is fortunately for you, the rules are really easy to memorise in fact. One must always capitalise the first and last words of the title. Always try to capitalise all the important words in the title which includes all nouns, verbs, adjectives, pronouns, and adverbs etc. You should remember that this includes only short verbs like “Is” or “Be” and common adjectives such as “His” or “Their.” Some Unimportant Words: Never capitalise articles (a, an, the), prepositions (at, by, in, to, etc.) and conjunctions (and, but, or, for, nor) these are three letters in length or less. The Four Letter Rules: One should capitalize all words which are four letters in length or more. This only includes longer prepositions such as “Before,” “With,” “Towards,” “Across,” etc. When writing the hyphenated words, one should always keep in mind that capitalizes the first element at all. In most of the time the subsequent element will be capitalized sometimes even if some exceptions exist. The second element does not get capitalized if is a word which would not usually be capitalized in a title (“Howto”) or if it is a modifier (“Bflat”). The second element is also not capitalized if the first one is a prefix (“Reeducation”). But keep in mind that the general capitalization options always trump hyphenation rules. Never forget to capitalize the final element of a compound that appears at the end of a title. I hope you will successfully understand this topic. Thank you very much for reading my post. Oh yes, if you think this lesson is helpful for you, then please share on facebook, twitter and google Plus. Knowledge World: Some English Grammar Rules for Capitalizing Titles.